Here’s a rare opportunity to e witness the earth’s largest land and sea mammals on the same day. Sri Lanka is a small island where you find nine National Parks with a reputation of being a home to a variety of flora and fauna. Most of these parks are famous for Asian elephants and other species while Yala and Wilpattu are the habitats of leopards and all other species too. The package with its wildlife tours in Sri Lanka mainly focuses on the main National Parks, which showcase scenic beauty of the island. The package originally designed for 13 nights / 14 days. But we are always cater to our valuable clients requirements and it can be customized for different durations as per request. After arrival proceed to Negombo where is approximately 15 minutes drive from Bandaranayke International Airport Colombo. Negombo is in the heart of Sri Lanka”s fishing industry. The sea and catamarans are the backdrop of the Negombo. Negombo is renowned for its fishing. Negombo’s fish market is quite possibly the island’s best. The city is dominated by shrines and picturesque churches due to its significant Catholic population. The biggest is the impressive, candy-colored church of St Mary’s, which exhibits some amazing ceiling paintings. Negombo offers some of the better beaches on the west coast of Sri Lanka, and draws tourists who stop over for a day on their way to or from the airport. Check in to your hotel and relax. Evening visit Muthurajawela Mash and join for a boat ride in Dutch channel. 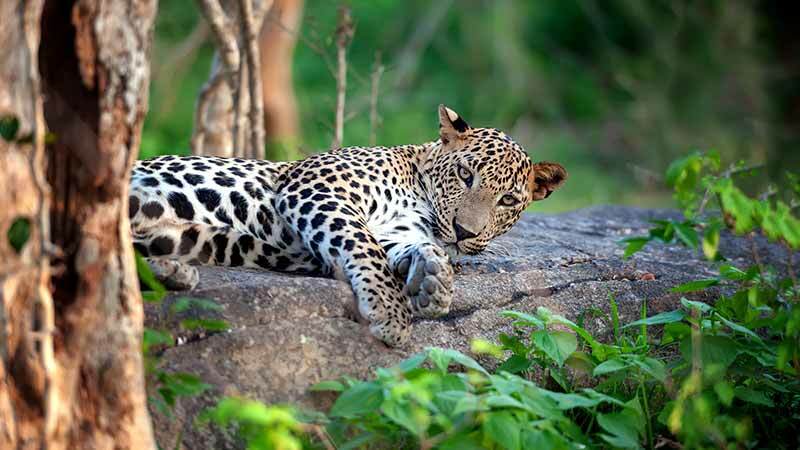 After breakfast in hotel proceed to Willpattu National Park, which is famous for Leopards and all other species. The park is located 30km west of Anuradhapura and spans the border between the North Central and North Western Province. It is bordered by the Modaragam aru in the south the Kala Oya in the north and is bordered by the Indian ocean in the west. The Wilpattu National Park is the largest national park in the area with an acreage of 131, 693 hectares. It is situated ranging from sea level to 152 metres above it. Participate for a Jeep Safari across the national park and you will be the luckiest if you can capture a leopard to your camera. Thereafter, check in to your camping site in Wilpattu or proceed to Anuradhapura for your stay in a hotel. After breakfast If you are interested in Culture, visit Anuradhapura one of the main ancient kingdoms in Sri Lanka. Then proceed to Habarana and stay leisure at the evening after check in to the hotel .If you are interested you can participate for an elephant back ride as well. Overnight stay at a hotel in Habarana. After breakfast proceed to Minneriya National Park for a Jeep Safari. Minneriya National Park is located between Habarana and Polonnaruwa. Covered an area of 8890 hectares park is an ideal place for elephant and leopard watching. The vegetation of this park is mixed evergreen and scrub areas. The important feature of this park is that 3rd century built Minneriya Tank is located in the park. During the dry season Minneriya tank becomes the ideal place to observe its natural wild life. Minneriya National Park is home to 24 species of mammals,160 species of birds , 75 species of butterflies, 9 species of amphibians, 26 species of fish and 25 species of reptiles. At Polonnaruwa you will have the option for a bicycle ride through the traditional villages of Polonnaruwa while visiting historical places. Polonnaruwa (218 km from Colombo) became established as the capital in the 11th century when Anuradhapura was abandoned due to foreign invasion. A dominant feature of the city is a vast irrigation lake of 5940 acres named Parakrama Samudra. The palace complex of King Parakrama Bahu is a medieval stronghold of moats, walls, guard houses, bathing ponds thick-walled multi-storeyed castle. The Atadage, The Hetadage, Gal Potha, The Satmahal Prasada, two Hindu Shrines known as the Siva Devale, The Alahanana Pirivena a 12th century monastic university, the Lankatilleke Shrine, The Gal Vihare which is one of Sri Lanka’s most unforgettable monuments – a group of three colossal Buddha images in seated, standing and reclining poses is carved with fluid grace and almost live expression on a huge rock face. Then proceed to the hotel in Habarana and overnight stay there. After breakfast visit Sigiriya Rock Fortress. Sigiriya (166 km from Colombo), the stupendous 5th century A.D. rock-fortress citadel of a fugitive king, where history merges with melodrama. A gallery of frescoes of shapely be-jewelled maidens still glows with vibrant colour and the water. It is believed these paintings depict the “apsaras” or goddess and some say it represents the lightning and clouds. Another distinctive feature of Sigiriya is the Mirror Wall which is located just below the paintings. The surface of this wall is well polished and covered with writings known as “Sigiri Graffiti” which are a form of poems. The Lion Staircase leads to the summit and the special feature of this is the massive Lion Paw which carved out of rock. The brick wall is still preserved in original form. Sigiriya is being currently excavated and restored by UNESCO under the Cultural Triangle Project and according to sources is most likely to be declared as a wonder of the world. Then proceed to Matale and walk around the well grown spice gardens. Visit a spice garden in Matale to see many different types of spices Sri Lanka is famous for. Just 25 km from the hill capital of Kandy, the Matale spice gardens are among the best on the island. You will be introduced to different spices and shown how some of these spices are grown and processed. Then proceed to Kandy and check in to the hotel. Evening visit Temple of Tooth Relic. Kandy 115 km from Colombo, Sri Lanka’s picturesque highland capital, last stronghold of Sri Lankan kings against European conquest from the 16 th to the 19 th centuries. It is the sanctuary of traditional culture, and the island’s most visited tourist resort. Kandy ‘s main attraction is the Dalada Maligawa, the Temple of the Sacred Tooth Relic of the Buddha brought to Sri Lanka in the 4 th century AD. This sacred relic has ever since been the symbol of sovereignty for its rulers and is always enshrined in great splendor. If you are visiting Kandy during July-August the Esala Perahera is definitely a must see. Termed as Asia’s grandest pageant, this spectacular annual event is held to honour the Sacred Tooth Relic of the Buddha and to obtain blessings of the guardian deities of Sri Lanka. Today visit Royal Botanical Garden after breakfast. Six kilometers from Kandy, at Peradeniya, the magnificent 57 hectare Royal Botanical Gardens, laid out in 1832, are among the finest in the world. Its treasures of tropical flora include fine collections of orchids, aromatic spices, medicinal herbs, palms and rare, endangered plant species. Optional – You can join for a trekking in Udawatte Kele Sanctuary which is just above the Royal Palace of Temple of Tooth Relic on this day. If you are a Nature Lover the Udawattekele Sanctuary which is a verdant nature reserve located within the district of Kandy with a wealth of indigenous and endemic plants. Then proceed to Nuwara Eliya which is famous as “ Little England” with its Colonial type city. Nuwara Eliya, meaning “city on the plain (table land)” or “city of light”, is a town in the central highlands of Sri Lanka with a picturesque landscape and temperate climate. Nuwara Eliya’s climate lent itself to becoming the prime sanctuary of the British civil servants and planters in Ceylon. Nuwara Eliya, called Little England then, was also a hill country retreat where the British colonialists could immerse in their pastimes such as fox hunting. Check in the hotel and overnight stay in Nuwara eliya. After breakfast at Hotel proceed to Horton Plains. The Horton Plain Plateau is a secluded wilderness sanctuary 2130 m high and offers one of Sri Lanka’s most unforgettable views. Here the land plunges down a dizzy gorge to the southern foot hills and on clear days, even a glimpse of the sea more than 80 km away. The Horton Plains are the habitat of giant Rhododendron (an evergreen shrub with large clusters of trumpet shaped flowers), tree fern primrose and daffodil orchids and birds such as the Sri Lanka Whistling Thrush and Arrenga, the Shaggy Bear monkey and the blue mormon butterfly and many other endemic and endangered montane species. Traditionally called ‘Maha Eliya’ the Horton Plains was founded by Sir Robert Hortain, the British Governor in 1831-37. and established as a nature reserve in 1969 and a National Park in 1988. Evening go for a boat ride at Gregory lake, Nuwara Eliya. Overnight stay at the same hotel, Nuwara Eliya. After Breakfast at the hotel proceed to Ratnapura via Kitulgala. Kitulgala is mainly famous for white water Rafting. Then proceed to Ratnapura where is very famous for Gems in Sri Lanka. It is the centre of a long-established industry of precious stone mining including rubies, sapphires, and other gems. Apart from gem mining, the city is known for rice and fruit cultivations. Large plantations of tea and rubber surround the city. Tea grown in this region is called low-country tea. There is a well-established tourism industry in Ratnapura. Sinharaja Forest Reserve, are especially popular among tourists. Check in to the hotel in Ratnapura and evening at leisure. After breakfast in the hotel, visit Sinharaja Rain Forest. a lowland rain forest which situates across several administrative districts in Sri Lanka. It is one of the least disturbed and biologically unique forests in Sri Lanka. The Sinharaja Forest it was declared a National Wilderness Area under the National Heritage Wilderness Area Act in 1988 and later on a World Heritage Site. It is Sri Lanka’s first natural resource to earn this esteemed distinction. Sinharaja Forest consists of a series of continuous ridges, aligned approximately in an East-West direction and lies between the tributaries of the Kalu Kanga in the north and the Gin Ganga in the south. Evening visit surrounding in Ratnapura to see the Tea plantations and waterfalls. After breakfast in the hotel proceed to Udawalawe. Udawalawe National Park is renowned for its outstanding scenic beauty and wealth of faunal species, particularly mammals and birds. It is a famous tourist attraction throughout the year for its unique fauna and flora. The Park is situated in the dry zone and conditions of the physical features are characterized by an annual drought coinciding with the southwest monsoon. The predominant ecosystem of the park area is the forest area with scattered grasslands and thorny shrubs. There are herds of elephants while populations of sambhar, spotted deer, barking deer, wild boar and water buffalo are gradually re-establishing themselves. After breakfast in the hotel in Udawalewe proceed to Yala National park where you will find the highest density of the Leopards in Sri Lanka. Sri Lanka’s oldest national park the Yala National Park is located in the south-east corner of Sri Lanka and has an area of about 127,000 ha. The major activities are bird and game watching, especially elephants which are best seen from October to December. It is 305 km from Colombo and access to the Park is via Ratnapura, Tissamaharama. Yala is by far the most popular national park in Sri Lanka and renowned for the variety of the wildlife, largely characteristic of dry zone tropical thorn forest and fine coastline and associated coral reefs. Overnight stay at a hotel in Yala or Tissamamharama. After breakfast in hotel proceed to a Beach hotel in Ahangama. Of course you will have different Beach stay options as you are travelling through the Southern Coast of Sri Lanka. Tangalle, Unawatuna, Mirrissa, Galle, Hikkaduwa, Benota are few beach options you have. If you are staying Near to Mirissa/Galle you will be having the option of Whale Watching depending on the season. Today is the last day of the tour. After breakfast proceed to the airport via Colombo which is the commercial heart of Sri Lanka. Camping is Available at Minneriya / Udawalawe / Yala national parks.